Home » FAQs » What is the best end of aisle containment door for a server room? After you have established your server room layout, your data center designer may recommend using end of aisle containment for proper air flow management. At AmCraft, we suggest three door styles: sliding, strip and hinged. See which could work for your data center layout. Strip doors have an easier installation than other options. 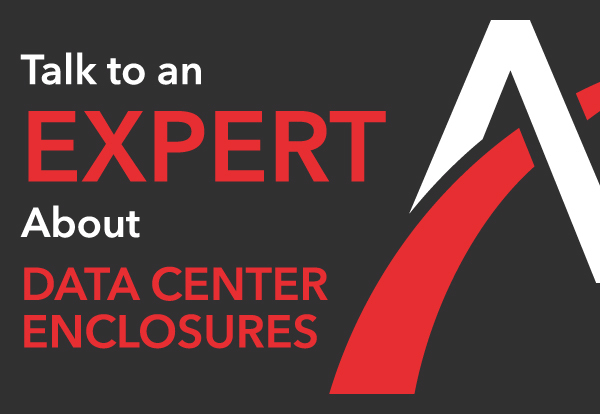 Your data center designer can cut the strips specifically to your server room design for customized air flow containment. Strip doors are also a more cost-effective end of aisle containment option, but cannot be lockable or made secure. Sliding doors provide excellent end of aisle containment. Although sliding doors provide a high level of protection and keep air flow contained, you can still enter and exit the server racks when needed. Hinged doors offer the same benefits as sliding doors, as they are both secure and easy to access. Those who need to enter the server racks, such as IT maintenance employees, may easily enter the server racks through these doors, which are placed at the front and back aisles of the data center. These doors also are air tight and keep the air flow contained. With a hinged door, the swing ‘into’ or ‘away from’ the server aisle requires extra space for the door to operate correctly. Contact AmCraft for additional assistance in choosing the best end aisle containment doors for your server room design.